You didn’t say that girls shouldn’t put themselves in risky situations, Your Holiness, because you know what we know – that sexual assault is not about what women targeted for sexual assault do to “increase” their risk. You didn’t say that girls are responsible for preventing sexual assault, because you know what we know – that the responsibility lies with perpetrators, not with targets and victims. We agree wholeheartedly with this agenda for young girls and believe this should be our message to girls in the U.S. as well. We only wish that you had made this recommendation to U.S. President Barack Obama during your recent meeting with him at the White House. We don’t think you did because they’d surely have put you in their “It’s On Us” video. The goal of that movement, they say, is to “…reframe the conversation surrounding sexual assault in a way that inspires everyone to see it as their responsibility to do something, big or small, to prevent it”. 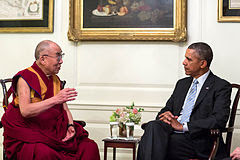 And what you said, Your Holiness, reframes the conversation by suggesting that women don’t need to just hope that someone else gets that “it’s on them”; you reframe the conversation by taking a stance, as the most influential spiritual leader in the world today, that women as equal pillars of humanity, have the right to and capacity for self-defense. So can you call President Obama back and tell him that? For quite some time now we have followed your teachings with great interest. We are, after all, among the many secular Americans who seek meaning in non-Western religious traditions such as Buddhism. Sometimes we’ve even found ourselves in situations thinking, the Dalai Lamai would not pay full price for that skirt, and the Dalai Lama would probably prefer drinks without high fructose corn syrup. Further, and perhaps more importantly, we have often thought that your wise comments on compassion, reproductive health, social justice, and inner peace are key to living lives that are meaningful. We also advocate training girls and women in self-defense. We know that you won the Nobel Peace Prize in 1989, and that you call yourself a feminist. We just hope that your recent recommendation to girls about self-defense is understood by others as not at all in contradiction with your being a Nobel laureate. For we know of your teachings about compassion as well as women’s rights. PS: Is being the Dalai Lama a good job?